For some reason it seems that it was only a year ago that Leeland released their sophomore album Opposite Way. Well that's probably because it was only last spring when Leeland put out their second album. 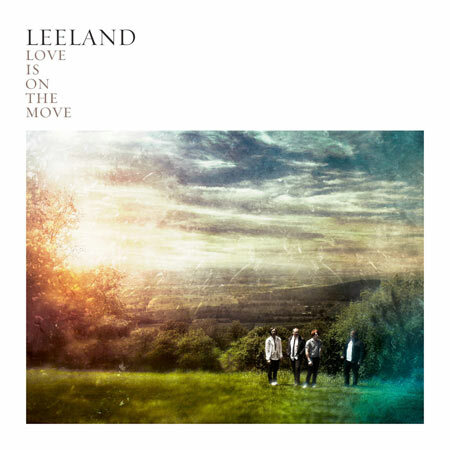 Skipping straight to the punch line, it seems that Leeland's quick follow-up album, Love Is On The Move may not have been the best move at all. After the band's popular debut, Sound of Melodies, the group certainly brought energy to worship music along with big expectations. Expectations that Leeland matched with their refined sophomore album. But, suddenly almost every single facet of Leeland's unique qualities seems to have been greatly watered down. To begin with what makes Love Is On The Move uneventful, is that there are no songs which resemble the rising worship song "Sound of Melodies." There are no tracks which quite capture the artistry of "Opposite Way." Or "Tears Of The Saint." Or "Brighter Days." Or "Count Me In." Or even "Yes You Have." It's not to say that Leeland doesn't try similar formulas. In fact, the title track attempts a hybrid of rising worship music with a light artistic touch to form a solid track. But the single "Follow You" sounds like a less passionate version of "Yes You Have," and guest vocalist Brandon Heath fails to impact the song in a significant way. While Love Is On the Move does features a handful of good tracks, it feels more like several run-of-the-mill worship tracks strung together by Leeland Mooring's voice. Probably the most memorable track is "Pure Bride" which begins with a great alternative/worship sound which then shifts to an upbeat stanza which captures Morning's anticipation for the Second Coming… Unfortunately the song doesn't end there. Leeland interjects a brief, but prominent warning, "What are you doing when no one is watching/what are you doing/children get your hearts right/God's coming for a pure bride," which fits into the context of the song but tips the musical equilibrium in the wrong direction. Other mishaps include the gradual upbeat tone of the piano driven "Via Delarosa" (AKA Road of Suffering and not a Sandi Patty cover) which should have remained light and melancholy considering the events leading up to the death of our Lord, and "Lift Your Eyes Up" where Morning's driving voice has the music playing catch-up for the entire song. The guitar fueled "New Creation" borders on unbearable due to Mooring's attempts to stretch his vocals to Phil Keaggy territory. Part of the attraction of previous efforts was the inspiring love songs to our Creator, but this time around they seem scarcer or, at least, less distinctive. "The Door" showcases some surprisingly shallow and cliché lyrics ("and we're walking together/Holding hands/Oh I wish it's just you and me Jesus") on an album which just isn't as impacting or original than the band's former releases. But the underlining theme, caring for the poor and needy, is vented well through the examples in the title track and on "Follow You" ("And I´ll... /Follow You into the homes of the broken /Follow You into the world /Meet the needs for the poor and the needy, God"). One could point to Leeland's new producer Ed Cash (producer of the not-always-original Chris Tomlin) as the source for Leeland's slide into the mediocrity. But despite all of Love Is On The Move's flaws, it's still better than your average praise and worship recording, as it offers mostly biblically based lyrics on top of a fairly complex, alternative influenced, music platform. But considering Leeland's prior stellar performances, the band's third album falls short of their potential.